Portinatx holidays transport you to a pretty, purpose-built resort on the northern coast of Ibiza. It is located thirty kilometres from Ibiza Town. Holidays to Portinatx can be taken from April until late October with temperatures rising from twenty to low thirties at the height of the season. It is a quiet, relaxed resort which offers a choice of soft, sandy beaches. 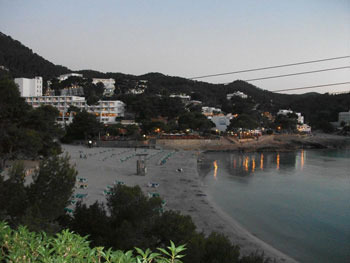 Holidays in Portinatx are very popular with families and couples of all ages. There is safe bathing for children and less confident swimmers and a variety of water sports are available for the more energetic visitor. Our range of cheap Portinatx holidays offer great value. Accommodation here is mainly modern, self-catering apartments. If you are looking for a guarantee of summer sun in a family friendly resort with a relaxed atmosphere, you may be tempted by our low cost Portinatx holidays. Restaurants cater for all tastes as they serve everything from traditional island fare to international cuisine. Nightlife here is low key, with the larger apartment complexes and hotels proving evening entertainment. Since our Portinatx holiday offers fly from the shelves, you will need to book early in order to avoid disappointment. For further details and to find our best Portinatx holiday deals, please use the search facility.